It's interesting yet unsurprising to see reports of the European Commission setting plans in motion to keep Britain in the EU. Who benefits from European Commission efforts to keep Britain inside the EU? Are they doing it for the British people, or EU self interest? If EU membership is such a benefit to the British people, then should it not follow that our membership must somehow be a burden to the EU? That being the case wouldn't a Brexit relax that burden on our hard pressed European neighbours? Britain leaving the EU would be a relief, wouldn't it? The reality of course is that British membership disproportionately benefits the EU. The EU needs Britain. We are a big net contributor to the EU budget, and among other things we have many crucial things that a political construct needs, such as a comparatively strong military, an advanced science and technology sector, and huge diplomatic reach in the world. The European Commission has a vested interest in assimilating what Britain has and using it for its own ends, hence the lengths to which it will go in order to keep us in the EU, perversely using our own money on propaganda to convince us to remain. If Britain being part of the EU could be described as a relationship then it's a parasitic one. The EU feeds off Britain and in return infects us with debilitating rules, such as the Water Framework Directive, which is contributing to the flooding in England which is having such a devastating effect on people. Not having control over how this country is run and what we can do on our own land to protect homes and businesses is already having dangerous, traumatic and costly consequences. Britain having to implement EU rules that cause us harm, an affront to democracy, is a powerful reason why we should vote to leave and completely exit the union for good. In addition to this, something that is incredibly ironic is that the British government is enthusiastically about to put into effect new domestic abuse laws regarding coercive and controlling behaviour. Behaviour of a kind so unacceptable it could result in an individual being imprisoned for up to five years, is somehow considered desirable and necessary by our government when it happens politically to this country at a national level. That is what David Cameron and his cronies want us to vote to continue putting up with. The double standards and hypocrisy are breathtaking. Increasingly we are seeing that being in the EU is not only sub-optimal, it is anti democratic and too often it is damaging to this country. This is not something that can be repaired by reforms that keep the EU as our supreme government. The only way to resolve this is to leave the EU completely and for good. We can co-operate in programmes and in areas of common interest, but we should be self governing to best serve the needs of the British people. We must vote to leave the EU. 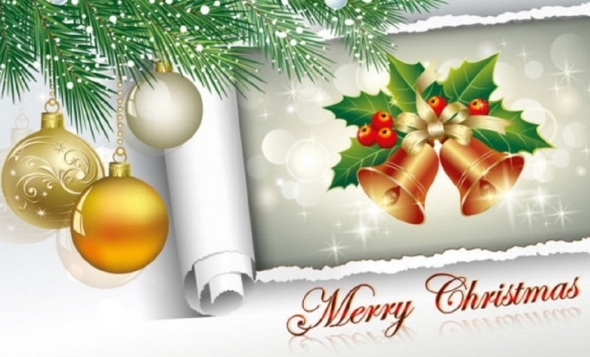 bring you and your loved ones happiness and good cheer. Why is anyone surprised at William Hague's EUphilia? It seems many Tories, pundits and members of the media have been left stunned by William Hague's endorsement of remaining in the EU. 'Oh, but he was always such a committed Eurosceptic' they bleat. No, he wasn't. You judge a person not by their mood music words alone, but by their actions too. Hague's actions defined him as a typical, deceitful High Tory establishment figure of the type that so adores being part of the EU. People in the Westminster village, and the time servers who 'report' on politics there, are only surprised at Hague's words because they ignore everyone and everything outside of their incestuous bubble. One former blogger I remember was ruthlessly exposing Hague's true position years ago, but the media ignored it because he wasn't part of the gang and had no 'prestige'. All that happened this week is that the media demonstrated it is incompetent in its role of keeping the public informed. The media were surprised about Hague as they will be surprised about Vote Leave's Brexit deception. They will also be surprised about the deal on associate EU membership when it comes, even though bloggers have set out the evidence of its creation in spades. They really are useless. While catching up from my recent blogging break, I spotted recent article penned by the arch EU federalist, Andrew Duff. In a previous post I described Duff as the best ally Brexiteers have in the fight against David Cameron, and with good reason. 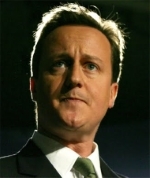 On 10th December he reinforced that description with an open letter to Cameron on his Blogactiv page. There are a few things worthy of coverage, but in this post we'll focus only on one, Associate Membership. On the topic of 'ever closer union', Duff helpfully reminds us previous British governments have not only accepted the commitment to ever closer union but have elevated it in terms of primary law. A more elegant way of settling your European dilemma would be to craft a new form of affiliate membership, short of full membership. Some are surprised that you have rejected that option. You are criticised for not spelling out your own concept of Britain’s ultimate destination. But you can justly demand of your EU partners that they also make more of an effort to specify their own concept of fiscal and eventual political union. What Duff is doing is preparing the way for a reform destination that has already been decided in the corridors of real power, in Brussels. 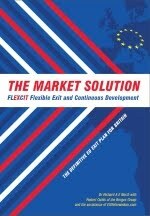 The EU needs this solution to enable the push for ever closer union among Eurozone countries. Cameron needs it so it can be passed off as British-forced reform that supposedly resolves all the concerns of eurosceptics and other British voters. The drama played out in the media is all part of the theatre. Duff is merely playing along in pretending Cameron has rejected the very two-speed construct he will eventually present as a hard won deal, wrested from what will be painted as a kicking, screaming and defeated Eurocracy. The media will plant the flag as usual, fawn and lap it up as a glorious victory over the EU. But the only change will be that Eurozone countries will have the freedom to push further integration without having to navigate approval from non-Eurozone countries. It's important to recognise and understand this plan, because when it comes to pass it will be possible to be ready to counter the arguments and claims that it represents a solid solution to British discontent with the EU. The only outcome of David Cameron's faux negotiation will be a form of associate membership. The destination is illuminated with halogen floodlights, if only people choose to look up and see what is in front of them. It's interesting to see that Matthew Elliott has broken cover to provide comments to his mate, Robert Colville, who has penned a puff piece for Vote Leave in Politico. If it is objective journalism and impartial assessment you hope for from such publications, then abandon that hope because it should be a contender for Private Eye's 'Order of the Brown Nose'. A brilliant networker and consummate professional, Elliott is part of the Westminster establishment and lives and breathes political campaigns. Some years ago, he came within a whisker of taking a job in Downing Street, so much so that he was given a guided tour of Number Ten and shown his future desk. It isn't the only example of saying black is white either, as Robert Oxley denies the dismissive insults made against Leave.EU and Arron Banks in particular. The piece also underlines Elliott's role in Vote Leave, where he controls 'the money, the finances, liaising with the board, liaising with the parliamentary parties'. This enables him to furnish his friends (Staines, Singh and Whitehurst) with lucrative contracts, while harvesting political data about millions of voters that can be sold for a huge sum to one of the very political parties he claims to fighting at the referendum. David Cameron talks a good game. He pulls that face of confected grave sincerity as he delivers his sermons to the people. But the words he utters are meaningless because no matter what promises and assurances he offers, he rarely keeps them. Some examples of this Cameronian habit of casual untruthfulness surfaced in the Telegraph on Thursday, regarding various pledges he has made about the demands he would make of the EU. It's by no means an exhaustive list and some of the items on there are somewhat irrelevant in the overall scheme of things. The real value of the piece is how it demonstrates Cameron's rank dishonesty. In Cameron we have a man who has initiated a UK negotiation with the EU, on exclusively personal terms, that deliberately ignore the fundamental problem with EU membership (democracy and accountability), and who will not even stick to the pledges he has made to the public. David Cameron is a pathological liar who cannot be trusted. As the piece shows, his public pronouncements are a ramshackle hut built on quicksand. They are mood music pledges that he never has any intention of keeping. It is all part of his effort to carry people along in the drama of the moment to mute opposition and get his own way. In the referendum campaign it isn't the EU that is our opponent, it is David Cameron, a man who will do and say anything to keep Britain firmly anchored in the EU. 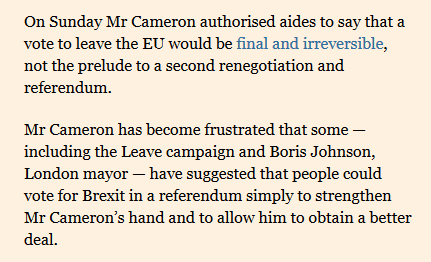 The way people vote will largely be determined by whether or not they believe what Cameron tells them about the deal he eventually presents. We should continually remind people they would be making a judgement based on the words of a liar. Apologies for the radio silence of the last month. Everything is fine, but it's been a hectic time with work and I've needed to recharge the batteries too. The work to secure a real and permanent Brexit continues, and it's great to see while I've been away that more bloggers have rallied to the rational campaign to make a sensible case for leaving the European Union, without any of the conspiratorial and xenophobic baggage that drags our side down. The blogroll will be updated to include our new colleagues. My thoughts and prayers are with those men and women who lost their lives in the barbaric acts of mass murder in Paris last night, as well as the family and friends they leave behind who will struggle to come to terms with what happened. The attacks were almost certainly carried out by Islamist terrorists, who are intolerant of anything that does not fit their narrow minded, absolutist and bigoted view of how life should be lived by everyone. They despise freedom. They despise difference. They despise the idea of democracy. We should be uncompromising in our determination to not yield one inch to them. Because what they want is completely unacceptable, namely submit to their demands or die, there can be no negotiation with them, so we must be unflinching in efforts to root them out and destroy them. What needs to be made clear though is that what happened in Paris is completely unrelated to the democratic imperative of leaving the EU. Some people who variously possess racist, xenophobic or cultural superiority beliefs, are using the terrorism of a relatively small number of homicidal maniacs as an excuse to demonise all muslims. They think that if all muslims can be grouped together and painted as an enemy, then a new apartheid can eventually be realised. After all, fewer dark faces around the place makes Johnny Racist a happy boy. These same narrow minded people are the ones whose main focus is stopping all immigration into Britain. Many are quasi-brainwashed devotees of the Cult of Farage. As such they seem to think it's a good idea to wrongly paint atrocities like Paris as somehow a consequence of EU membership and freedom of movement, and therefore seize upon such events as a convenient justification for demanding Brexit. It is irresponsible, disgraceful and damaging behaviour that undermines the moderate and rational effort to leave the EU. Far from speaking for the majority in this country, these bile-filled people will repel the majority and risk undermining the prospects of a leave vote at the referendum. 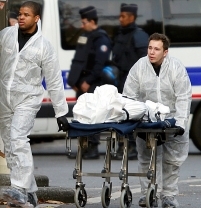 The nausea felt at the terrible events that unfolded in Paris last night has been compounded today by the all-too-predictable reaction on social media of those on the extremist fringes of our society. It is sick inducing. If only they would shut up and slither back under their stones. The BBC is reporting today that David Cameron is to warn European leaders he will 'think again' about the UK staying in the EU if his demands for reform are 'met with a deaf ear'. Cameron has been forced to send a letter to the European Council president, Donald Tusk, setting out the changes he wants for the UK, following repeated complaints that the EU has no clear knowledge of what Cameron's wishlist is. "If we can't reach such an agreement [on reforms], and if Britain's concerns were to be met with a deaf ear, which I do not believe will happen, then we will have to think again about whether this European Union is right for us. As I have said before - I rule nothing out." The language is meticulously precise. The use of the word 'this' is no accident. It is an essential component in the sentence. Cameron is making a distinction between the EU as it is today, and the EU as it may be in the not too distant future following an eventual treaty and distinction between the 19 Eurozone and nine non Eurozone EU member states. Cameron wants people to form the impression from his speech that he would be willing to leave the EU if he doesn't get his way, but in truth he is giving himself cover to endorse a form of associate membership instead, which will keep Britain in the EU. Heads he wins, tails Brexiteers lose. 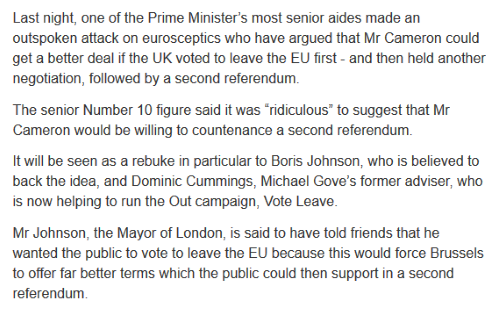 This shows there isn't a lot of difference between Cameron's position and that of Matthew Elliott and Dominic Cummings' business venture and phony Leave campaign, Vote Leave Ltd.
Elliott and Cummings want more reforms than Cameron is asking for, and their cynical campaign is about getting people only to vote to leave, but only so the result can be used to improve the bargaining position with the EU to secure more concessions. But both they and Cameron have the aim of Britain remaining in the EU at the end of the process. In order to win a war it is vital to understand who your enemy is. Cameron, Elliott and Cummings are far bigger and more dangerous opponents of those who want Britain to leave the EU for good than even the Stronger In campaign. We know them and we can see their plan. Now we need to ensure genuine leave campaigners understand it and how to defeat it. This blog has consistently explained that all available evidence demonstrates that the Vote Leave campaign has no intention of Britain leaving the EU for good. Instead it is clear that they are campaigning for a leave vote only to give leverage to David Cameron to help secure more EU reforms to remove the need for Brexit. This has been backed by mainstream media stories that explain what Dominic Cummings' game really is. This has resulted in Cummings and Robert Oxley refusing to answer any points on Twitter. It has also resulted in Mark Wallace of Conservative Home claiming it is all a conspiracy theory, despite his inability to produce any evidence that defeats my argument. 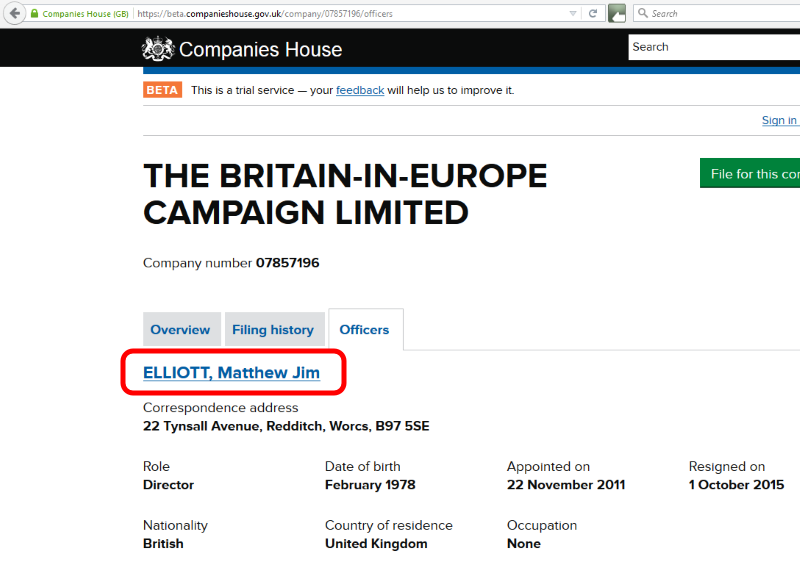 Now we have information, publicly accessible on the Companies House website, showing that until 1st October 2015, the newly silent CEO of Vote Leave, Matthew Elliott, was a director of a limited company called The Britain in Europe Campaign Ltd.
We very quickly received a request sent via another blogger from a senior Tory politician and Vote Leave associate, to kindly please stop sharing this information on the internet. According to this person, The Britain in Europe Ltd name was purely a blocking move. There are a few problems with this person's assertion. Firstly, why did Matthew Elliott only resign as one of its directors two weeks after Vote Leave was incorporated with Companies House? Second, why was he a director of it for four years when the company continues today with William Norton as sole director? Third. if the company was a blocking move, why has the 'britain-in-europe.com' internet domain, or variations of it, not been registered? Fourth, why are there not variations of the name in terms of limited companies? now shown to have been pushing a pro-EU membership reform line at Business for Britain, while also being a director of a company whose name, Britain in Europe Campaign Ltd, shows it advocates Britain remaining in the EU. In any case, taking a company name doesn't block anything as the name of the limited liability entities rarely if ever is the same as the name of the campaign. There is no reason to have a company incorporated with that name unless the aim is to have it reserved for use. Too much doesn't add up about Vote Leave. The more we scratch beneath the surface, the more we see reasons to believe it isn't about leaving the EU at all, rather it's a mere trojan horse for people with a pro-EU membership reform agenda. Vote Leave is not on the same side as those people who want Britain to leave the EU for good. Against a backdrop of Dominic Cummings refusing to answer any questions or points made by this blog, and Matthew Elliott's protege, the Conservative Home editor Mark Wallace, dismissing the evidence presented as a 'conspiracy theory', the increasingly absurd Vote Leave campaign has released its first 'Monthly Big Picture Update'. You can read it here. You can imagine our surprise to discover there is nothing in it about actually leaving the EU... Sarcasm aside, there is just the usual chuntering about 'voting to leave' and an undefined negotiation, followed by the now familiar vacuum where people should reasonably expect explicit details of Vote Leave's intended destination and a plan for getting there. Looking at point 1 in the image above, we see the continuation of Vote Leave talking about 'voting to leave' but nothing beyond that. They want the support of people who want Brexit, but where is the commitment to Brexit at the end of this yellow brick road? The Dominic Cummings Grand Design continues. NB: We have repeatedly asked Vote Leave's campaign director, Dominic Cummings and head of media, Robert Oxley, is the position of Vote Leave that Britain must leave the EU for good? They have refused to answer that question. They have never once argued that Britain must actually leave the EU. So it comes as no surprise that their campaign material continues to exclude any reference to actually leaving the EU after a vote to leave. 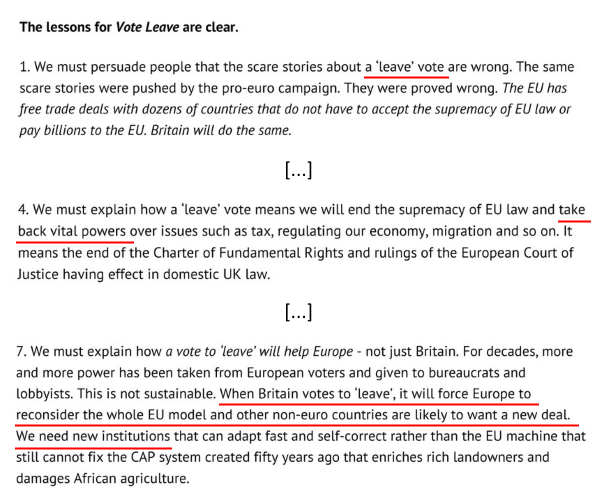 As you can see in point 4, Vote Leave talks about taking back powers over some issues. That isn't Brexit. That isn't taking full control of one's own country. It is the Business for Britain reform agenda. It means Britain would remain in the EU. When we move on to point 7, we can see Vote Leave's true intentions. Why does the EU model matter if we are planning to leave? Why would new institutions be of any relevance if we are leaving the EU? Consideration for the EU model and new institutions only matters if you plan to be part of them by remaining in the EU. Again, this is all about reform and nothing about Brexit. The reason why Vote Leave never talk about leaving the EU for good is that they have no intention of that happening. It is not part of their agenda. When you add all of this together, we believe any reasonable person would conclude that Vote Leave's true intentions are in no way anything to do with leaving the EU. Readers should draw their own conclusions. But if it is clear to you that Vote Leave is only masquerading as a Leave campaign to achieve ulterior EU reform aims, we hope you will agree that the responsible course of action is to bring it to the attention of as many people as possible, so they are not taken in. In rushing forth to disown and discredit the Norway Option yesterday, Vote Leave's campaign director, Dominic Cummings (salary of no more than £99,000) leaves himself open to an obvious question, if not the Norway Option as the first step in a planned, staged withdrawal that protects British business interests, then what? 1/ DC is talking Britain down - we could negotiate a free trade deal with EU & access to SM without accepting supremacy of EU law. 2/ Lots of countries trade with EU without accepting supremacy of EU law. Why does DC think UK is too weak/useless to do this? 3/ UK future shd be based on sci/education/global cooperation/new institutions - not the failed 1950s experiment in bureaucratic centralism. 5/ After we #VoteLeave we'll do what DC shd have done - have proper roadmap & serious negotiation > better deal for us AND Europe AND R.O.W. 6/ Now the PM is inviting ideas about what to do after he's failed, we will be v happy to set out a roadmap of how UK future cd be brighter. On point 5, where is the roadmap and what exactly does he want negotiated? He doesn't say 'when we give notice we are leaving the EU' that negotiation should take place. Once again it is evident that his vision is a vote to leave triggering a more serious version of what Cameron claims to be doing now, which is getting crumbs from the table. Vote leave, but to what end? No plan, no roadmap, no commitment to permanent Brexit. Warning bells should be going off in the head of every person genuinely in favour of Britain leaving the EU. Instead of a leave vote being an expression of the British people's wish to leave the EU, Cummings wants it to be a negotiating hand to secure a reform deal that gives Britain back some powers, but keeps this country in the EU in some form or other. This is clear in point 7, which begs the question, if the idea is to leave the EU, why does having influence in the EU matter? Outed by his own words, Cummings is caught up in his own web. He has also discovered that he cannot demand a unilateral derogation from EU primary law, which consists mainly of the EU’s founding treaties. And he now seems to realize that to try to change ordinary EU legislation is too risky and lengthy a process because of the mandatory involvement of the European Commission and European Parliament. That leaves Cummings' negotiated deal dead in the water. But perhaps that is by design, because the reform agenda he really wants pursued is the one that results in some form of associate membership of the EU. 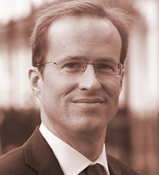 Matthew Elliott has called for a 'two tier Europe', Daniel Hannan has called for 'associate status'. They are two of the leading lights in Vote Leave, so they know what's really going on behind closed doors in that counterfeit campaign. It is an outcome the blogs have been talking about since the principal architect of associate membership status, Andrew Duff, began talking about it in 2013. Interestingly, it is only in recent weeks, since the notion was picked up by the media, that Duff has censored the term from his own articles. He has made reference recently to 'a new form of affiliate membership' and in yesterday's piece spoke about Tory failures to articulate 'a serious alternative to full EU membership' (emphasis mine). The destination is obvious to all but the most die-hard Vote Leave supporters. 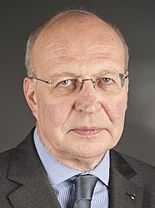 So the question now has to be, when will Cummings come clean, be honest, and tell people his campaign isn't about leaving the EU at all? When will Cummings' role as the Tories' useful idiot, helping Cameron to keep Britain in the EU, be recognised for what it is and treated accordingly? Britain Stronger in Europe (they mean the EU, but are desperate to mislead people) the people at British Influence, and David Cameron are working aggressively to rubbish the so called 'Norway Option'. Why? Their hope is that if they talk it down, people will dismiss it as an initial alternative to EU membership. They even call in aid Norwegian politicians, but are careful only to use those who want to join the EU, while ignoring the many who do not. What are they so scared of? In short, copying Norway (a member of EFTA) would mean continued single market access after leaving the EU, a veto over EU directives and the ability to help write the laws and regulations made at international level before they are passed down to the EU to implement. If Britain had these things, why would we need to be stuck with the EU they are trying so hard to keep us a part of? Wrong. Norway and the other EFTA countries have more influence over the rules and regulations that are turned into laws. In fact, they actually get two bites of the cherry in influencing their shape. As a non-EU country, Norway represents itself on the world stage. 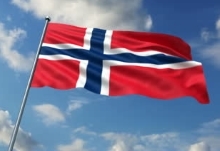 Unlike every EU member state, Norway has seats on the international bodies where rules are developed and decided, before being handed down to the EU to implement. EU member states are not allowed to represent themselves, the insists on having a single position for all 28 member states, which is a generally a diluted, compromise position. But then as members of the EEA (single market) the EU consults Norway and the other EFTA countries on the measures to be implemented, giving them an opportunity to influence the shape of the implementation. So Norway has more than just a say, it also gets to shape the rules from the outset and again at implementation. This gives Norway far more influence than any EU member state. Wrong. The number of legislative acts that apply to EU member states is far greater than applies to Norway and the other EFTA countries. The details are not collated centrally for easy reference, so Dr Richard North put a huge amount of time and effort into collecting the information in one place for comparative purposes. North found there are over 20,800 legislative acts in force that apply to EU member states. However Norway and the other EFTA countries only have around 5,500 legislative acts that apply to them. He covers this in his roadmap for staged withdrawal from the EU, Flexcit (see from p172). Wrong. The money paid by EFTA on behalf of its member countries, which includes Norway, is a contribution to help the functioning of the single market. EFTA's budget showed that in 2014 the total contribution for the single market was CHF22,360,000. Converting those Swiss Francs into pounds gives a total of around £16 million. 55 percent of that total contribution was borne by Norway, which equated to around £8.4 million. Details here. The claim the Europhiles keep making is something along the lines of 'Norway pays two-thirds as much per head for access to the Single Market as the UK pays as a full member of the European Union'. It simply isn't true. The single market contribution divided by the population of Norway means the cost for every man, woman in child was actually £1.66. This is a far cry from the £115 claimed by BSE. BSE, Cameron and the others include in their false figure a number of voluntary payments called "Norway Grants", made by Norway to eastern enlargement countries to help with their post-Communist economic rehabilitation. In the six year period 2009-14, these voluntary grants amounted to €804 million and have nothing to do with the single market. That money does not go to the EU, it is not part of the EU budget. Details here. BSE and Co have also included monies paid into the EEA grants system, which again does not go to the EU, but rather the independent Financial Mechanism Committee, which is again nothing to do with the single market. When added to the Norway Grants, the country made a total contribution of around €1.7 billion. Additionally they have added in Norwegian voluntary contributions to various EU and inter-regional programmes, such as Erasmus+. Horizon 2020 and Copernicus, which again are nothing to do with the costs of the single market. In fact countries even outside the single market participate in these programmes. Is the Norway Option the way to go? Yes and no. It is not the panacea. Yes, because it represents the best first step on the journey out of the EU. It means single market access without most of the political control by Brussels. As such it serves well as an interim solution as Britain re-develops the capability to self govern in those areas previously controlled by the EU. No, because long term Britain can aim for a much better settlement where the single market is built on intergovernmental cooperation, through UNECE in Geneva. That would mean we could administer our international trading arrangements without having to give political control to a treaty organisation like the EU, which has political integration as its main objective. 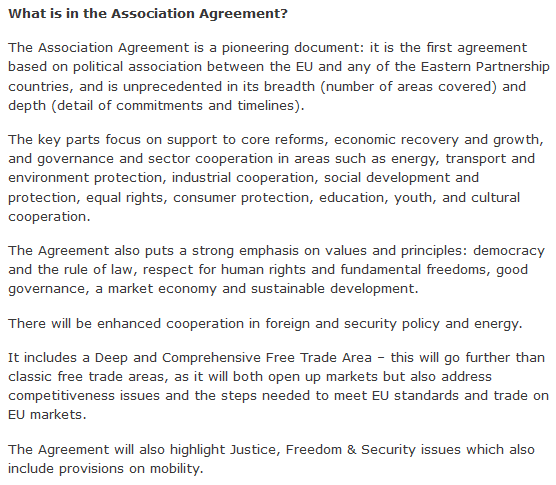 If the pro-EU politicians in Norway and the EFTA countries can fool voters into supporting something like associate member status, then the EEA would effectively end and EFTA would be disemboweled. Norway would have to give up its seats on the executive committees of the main international bodies, because as part of the EU, it must let the EU speak for it, thus losing influence to shape regulations by being removed from the top table and escorted out of the room. As one of the wealthier countries its EU contributions would almost certainly be far greater than what they pay now for the single market, for eastern European development, for grants and for programmes. By the time voters see what has happened, it would be too late. It would be locked in to the pathway to political integration. It's frustrating that before Brexiteers can get at the real opponent in our fight to leave the EU, David Cameron, we have to tackle people who only want a vote to leave in order to secure a reform deal that keeps Britain in the EU. Now the Financial Times has joined the Telegraph and Sunday Times in sharing with its readers the reality of Matthew Elliott and Dominic Cummings' devious plan to achieve the long standing reform aims of the Business for Britain campaign. Make no mistake, this is not infighting. Infighting takes place between people on the same side. The Vote Leave campaign is not on the side of people who genuinely and permanently want to leave the EU. For Vote Leave, the referendum is a means of Tory supporters strengthening the renegotiation hand of a Prime Minister who is completely committed to remaining in the EU. They only want a vote to leave so that Cameron has a better chance of negotiating a reform package to their liking. Why the likes of Owen Paterson (Con), Kate Hoey (Lab) and Douglas Carswell (Ukip) appear unable to see and understand they are giving aid to people who want to remain in the EU, eludes me. Perhaps they share that reform objective? People who support 'Vote Leave, Take Control' are, unwittingly or otherwise, backing a campaign that has no intention of Britain exiting the EU for good. Dominic Cummings' idea of a second referendum has got the attention of the media via a piece in yesterday's Telegraph and a piece today in the Sunday Times. Instead of it being about getting voters to approve the post-Brexit treaty that would need to be agreed between the newly independent UK and the EU (which would be sensible) the Cummings Grand Design makes a second referendum about getting approval for a new deal for associate member status, which would see Britain, instead of permanently leaving the EU, assuming associate member status that keeps us in a reformed EU. This is the outcome Business for Britain and Matthew Elliott have always pushed for. We are asked to believe that, with the exception of a couple of Business for Britain supporters who have jumped ship, all of them have changed that position over the summer and back Vote Leave in wanting British voters to vote to leave the EU. How likely is that, especially as David Cameron is supposedly still talking to the rest of the EU to get that new deal? As conversions go, that puts Saul's on the road to Damascus in the lower leagues. shows that Brexit is not Vote Leave's end game. Voting to leave at the referendum is just a stage in a process they are following that aims to deliver what the Business for Britain community and Conservative party hierarchy have long wanted. Namely, Britain staying in a reformed EU. If you wanted to leave the EU and be independent you would surely have a plan for how that could be done. Vote Leave doesn't. Go figure. If this is incorrect why is it that when asked, Dominic Cummings has repeatedly refused to unequivocally state that Vote Leave's position is that Britain must leave the EU permanently? He has never gone beyond saying the campaign's position is that people should vote to leave. The position even allows him to tell people that he personally supports Brexit, because in the Vote Leave plan matters would not be allowed to rest there. Cummings has twisted and turned, claimed clarity exists on his website that simply does not, and eventually run away from the questioning on Twitter in the hope it will all go away before people realise the game he is playing. The Cummings Grand Design seeks to have people vote to Leave, only to get Remain in a 'Reformed EU' after a second referendum, following a negotiation that has paved the way for EU associate member status. This is the so called 'reform' option. It keeps their Business for Britain backers on side. If this isn't correct here is the challenge to Cummings... state today, clearly and unequivocally, that Vote Leave's position is that Britain must leave the EU for good. State that the only deal that should be sought is the one that establishes the new relationship between the EU and newly non-EU, non-associate member, independent Britain, where Britain stays out of the EU permanently. If Vote Leave want Britain to leave the EU, why won't they say so? 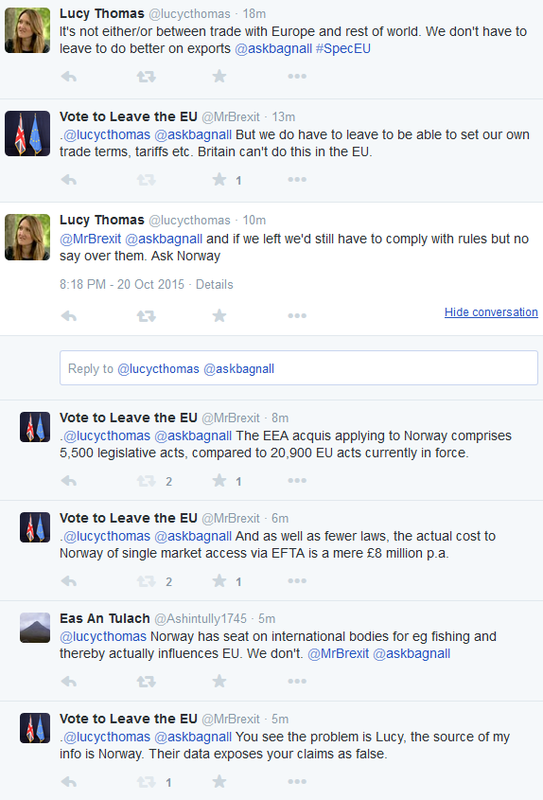 It would be easier getting blood from a stone than getting a straight answer from Vote Leave on this subject. Since my last blog post Dominic Cummings has tweeted me in response to the questions I have been asking. Cummings' tweets however take people no closer to an unequivocal statement about Vote Leave's objectives. So I have replied to this morning's three messages with some very clear and straightforward questions. After all, €lliott has been silent since the campaign launch and has been deliberately kept out of the public eye exactly because everything he has said runs contrary to what Vote Leave want people to assume and believe the campaign stands for. If he has changed position, let him say so publicly and explain why. Here again we see the Business for Britain line being taken... undefined references to 'change', and talk of a 'new UK-EU deal', but no mention of Brexit. Plus, you may wonder, what are 'maximum sensible changes'? Surely if Vote Leave wants people to vote to leave the EU, the only change that is needed is leaving the EU. But why do they doggedly avoid any mention of that? Why is Cummings' language about the Vote Leave position intentionally vague? We can leave the EU or we can negotiate a hypothetical reform deal with them. The two outcomes are mutually exclusive. Cummings talks of a deal, so this is the 'stay in a reformed EU' agenda writ large. The fact is, despite Cummings' claim, there is nothing on their website that is any different from the Business for Britain narrative on securing reforms, some powers coming back to Britain, undefined new relationships and opt outs from some EU laws. Nowhere on the Vote Leave website is there any talk of Britain leaving the EU. Hence the need for a yes/no answer to the question I have replied with. However, his subsequent reply a few minutes ago as I am writing this post, shows he is dancing on a pin head. I asked him, 'Is your campaign's aim Brexit from the EU? Yes or no. His response is nothing short of farcical. Cummings is trying to convince ordinary voters who want Brexit to support Vote Leave in order to bolster the unchanged Business for Britain EU reform agenda. Negotiating with the EU for a new deal can result in continued membership... it is not the same as leaving the EU. He intends a vote to leave to be used as nothing more than leverage for David Cameron to secure the reforms his business backers want, which will result in Britain remaining in the EU. Britain leaving the EU is not part of Vote Leave's agenda. That is why Cummings will not say that it is. Their desired outcome is clear. Vote to Leave, get Remain in a reformed EU. Returning readers may recall a blog post we published 10 days ago explaining why there is enormous doubt about Vote Leave's suitability to be designated as the official referendum leave campaign. Now there is no doubt. Vote Leave must not get the designation as the official leave campaign. Cummings didn't reply to the question. With that in mind, I began asking the head of media for Vote Leave, Robert Oxley, a yes/no question about whether Vote Leave pledge to fight to leave the EU no matter what 'reforms'/'deals' Cameron presents to the British public. There was no reply to that either, despite a good number of retweets and my posing the question several times. 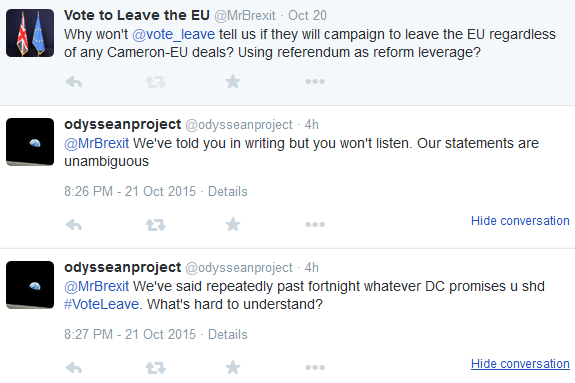 However, Cummings did decide to reply last night to a separate question concerning Vote Leave's plans regarding the referendum. It was a piece of misdirection, because they have not ever said they will campaign to leave the EU, only to vote to leave in the referendum. Vote Leave have said on their website that people should vote to leave the EU, even if Cameron presents a 'deal' offering Britain some form of associate membership of the EU. But Vote Leave have stayed doggedly silent every time they are asked if they will fight for Brexit no matter what. Vote Leave only ever go as far as saying we should vote to leave in the referendum, but they never refer to leaving the EU. The evidence suggests they only want people to vote to leave in order to strengthen Cameron's hand in pushing for a reform deal that keeps Britain in the EU. So, as we need to ask very explicit questions to pin Dominic Cummings down on this point, we replied with the following two tweets. Whatever the politicians claim, the best thing to do is to vote 'leave' and force the politicians to start negotiating. This is exactly what Daniel Hannan called for in his recent article on Conservative Home we covered the other day. Having spent years making out he wants Britain to leave the EU, he explained how nothing would make him happier than for David Cameron to come back from Brussels with a deal that he could support, before going on to say that as a result of campaigning to leave, if the polls swing far enough to the 'leave' way, and a David-Owen-type deal follows, Brexit will become unnecessary. €lliott and Cummings' campaign is significant not for what they say, but for what they don't say. Nowhere do they say anything about leaving the EU, and that is because they want a reform deal that keeps Britain in a 'reformed' EU. Vote Leave is the ultimate Judas Goat, a campaign seeking the support of people who genuinely want to leave the EU, while having no intention of bringing about that outcome. In its own way it is a form of entryism, trying to control the campaign to leave in order to change its principles and stop Brexit coming to pass. If €lliott and Cummings win the designation as the official leave campaign, we will either lose the referendum, or win it but see their campaign backing Cameron to secure reforms so Britain will remain in the EU, almost certainly in the two-tier structure €lliott has already declared he wants to see. The challenge is clear. Before we can defeat Cameron and the pro-EU BSE campaign, we have to defeat €lliott and Cummings' counterfeit operation. If you want Brexit, they are not on your side. In the latest edition of the committed pro-EU magazine, The Economist, we find one of its 'special reports' on Britain and Europe. It's noteworthy for the angle it has taken. It has attempted to steal some of the Leave side's thunder by shifting away from the usual Europhile approach of fearmongering about imagined economic consequences of Brexit, and talking about the real issue at the referendum... politics. Right off the bat this article set out to assert that leaving the EU would mean Britain lost influence. 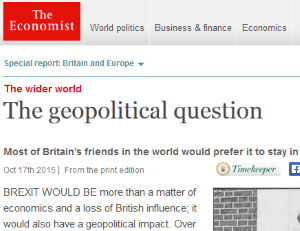 It later set out to suggest some make believe common position that 'Eurosceptics' hold regarding the 'Anglosphere'. Britain's EU membership prevents this country from representing itself or its own interests on the bodies where the rules and standards that become laws, are made. That isn't influence. That is being rendered silent and invisible and having to accept whatever deal the EU signs up to. On more than 70 occasions Britain has opposed proposals from the European Commission. Each time it has been over ruled, undermining British interests. So where is this mythical influence? Some people who want to leave the EU have romantic notions of turning back towards the Commonwealth, some of forging a loose bloc of English speaking nations. The fact is most 'Leavers' want Britain to turn its face towards the whole world and seize opportunities not realised by the EU because of the interests of other member states. The ability to set our own terms of trade and to co-operate on an intergovernmental basis with any non-EU country would benefit business and restore our influence in the world. The EU is a supranational entity rooted in a 1950s mindset that sets out to subvert democracy, and ill-serves the interests of modern, industrialised nations with large economies and a global outlook. We should vote to leave the EU. Hopefully some of this might be useful to those of you who engage online on blogs, Twitter and Facebook. Please help challenge the dishonesty of our opponents and spread the word about what we stand for. Let's take on and defeat those who want to cement Britain in the diminished position we find ourselves, where we're invisible in the corridors of power and voiceless in the rooms where decisions that affect British people and businesses are made. What I find most frustrating about the respective EU referendum Leave campaigns is that they have an open goal to attack in the shape of the 'Britain Stronger in Europe' (BSE) operation, yet they are not even trying to shoot. I was able to challenge her with some facts that she cannot counter. As such she has retreated until a time when she can try her ridiculous claims on someone else.This shows the importance of being informed and having access to details that I can draw on in such encounters. Richard North painstakingly established the information about the number of laws applicable to non-EU members of the single market, such as Norway, from a large number of sources as the information isn't collated in one place for comparative purposes. He found that over 20,800 legislative acts that apply to EU member states are in force. However Norway and the other EFTA members do not have to follow all the laws. In fact they are subject to around 5,500. As for having no say over the rules, Norway and the other EFTA countries actually get two bites of the cherry. As non-EU countries they represent themselves on the world stage and have membership of the bodies where rules are developed and decided, before being handed down to the EU to implement. EU member states are not allowed to represent themselves, the EU does it for them and presents a diluted, compromise EU-wide position. So Norway has more than just a say, it gets to shape the rules from the outset. But then as members of the EEA (single market) the EU consults Norway and the other EFTA countries on the measures to be implemented, giving them an opportunity to influence the shape of implementation. This demonstrates that Lucy Thomas' claim is moonshine. If you've ever read Lucy's ramblings elsewhere you may be asking where the figure of £8 million for the cost to Norway of single market access comes from. After all, Lucy and her Europhile friends keep claiming the cost to Norway of single market access is huge. The claim the Europhiles usually make is something along the lines of 'Norway pays two-thirds as much per head for access to the Single Market as the UK pays as a full member of the European Union'. It simply isn't true. They have also included money paid to the EEA grants system, which again does not go to the EU, but rather the independent Financial Mechanism Committee, again not connected to single market, which when added to the Norway grants meant a total contribution of around €1.7 billion. Additionally they have added in Norwegian voluntary contributions to various EU and inter-regional programmes, such as Erasmus+. Horizon 2020 and Copernicus, which again are nothing to do with the costs of the single market. We can defeat BSE and their cynical spin merchants just by using the facts. It would be nice if Leave.EU started doing this instead of churning out dodgy claims of their own just to attract attention, but we seem a long way from that level of competence. They are throwing red meat to the people who are already on our side. They are doing nothing to win over undecided voters who will want powerful reasons to vote to leave. 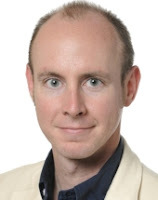 And Vote Leave poster boy, Daniel Hannan, has said in recent days that 'Nothing would make me happier than for the PM to come back from Brussels with a deal that we could support,' and 'The only way to inspire them to greater radicalism is to start campaigning to leave. If the polls swing far enough our way, and a David-Owen-type deal follows, Brexit will become unnecessary.' Vote Leave is no more a fifth column pretending to want to leave in order to service their reform agenda. The problem with having a Leave campaign that is owned and run by people who have never publicly called for Britain to leave the EU, but instead have long urged David Cameron to secure a deal to 'reform' of our EU membership, is that you cannot trust their apparent conversion. Ah, some readers will say, Hannan and the Eurosceptics are just trying to raise the bar impossibly high. Actually, we’re not. Our key aims – the supremacy of UK law on our own soil, more freedom to strike bilateral trade deals with non-EU states and the right to determine who can settle on our territory – are remarkably moderate. Nothing would make me happier than for the PM to come back from Brussels with a deal that we could support. As long as Sir Humphrey in Brussels and Jim Hacker in Westminster believe that they can win a referendum with only minor changes, that’s all they’ll ask for. The only way to inspire them to greater radicalism is to start campaigning to leave. If the polls swing far enough our way, and a David-Owen-type deal follows, Brexit will become unnecessary. Hannan has revealed his dishonesty and his willingness to put Tory interests before all else. He has performed his role as a Judas Goat to a tee. This is a man who has built a large following of people who genuinely want to leave the EU and believed he wanted the same, but kept them on the side of the Tory party machine that has no intention of leaving. Hannan's own words reveal that he is happy for Britain to remain subordinate to the EU provided some crumbs from the table are forthcoming. People can draw their own conclusions about this silence, but any reasonable person might conclude as I do that that the duplicitous Hannan and the Vote Leave operation are campaigning for a vote to leave at the referendum, not so the Britain exits the EU, but in order to give Cameron leverage to force a deal from the EU that ensures Britain remains docked permanently to Brussels. Ronseal might do what it says on the tin, but Vote Leave doesn't. 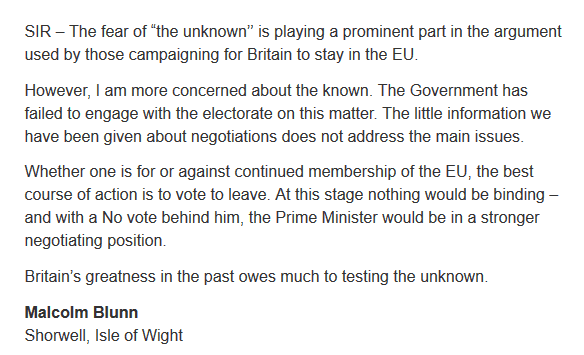 By way of an illustration, Vote Leave's thinking is neatly encapsulated in the third paragraph of this letter to the Telegraph shown below, which was published on Sunday. That third paragraph is what Vote Leave wants to achieve. There was no conversion from the Business for Britain push for continued membership with some reforms. As pro-EU people have corrupted the word Eurosceptic, the €lliott/Cummings business venture is corrupting the word Leave. People who genuinely want to leave the EU no matter what, need to be aware that supporting Vote Leave is to support a plan to keep Britain in the EU. It is just a plot hatched by a small group of Tories, aided by a couple of useful idiots from Labour and Ukip, to strengthen Cameron's hand to secure as yet unspecified reforms. These people are not for Brexit. Their whole campaign is a sham. Don't be taken in by it. In the months ahead, the referendum debate will see claims and counter claims made by both sides of the Brexit campaign. Not only will this turn off people who aren't political anoraks, but it could lead to the loss of credibility if incorrect 'facts' are used and debunked. Brexiteers should avoid churning out figures and claims that are disputable. They may look impressive on graphics fired out on Twitter and other digital media, but most data are compiled using different methodologies, or make false assumptions that can be challenged and make a nonsense of those figures. Also, the Leave side must resist the temptation to call in aid long standing prominent opponents when they make highly qualified statements, such as the comment by Lord Blackwell, who will almost certainly vote to remain in the EU when the day comes. However, setting those things aside, the message I want to convey in this post is that it's vital to be precise in what you say. In order to maintain stable relations with the EU, Ukraine shall conclude an Partnership and Cooperation Agreement, the implementation of which shall become the first step towards its association and, later, full membership in this organization. This destroyed his original assertion. The Ukrainians themselves make clear the association agreement is a step in the process to becoming a full member of the EU. The Dutch eurosceptics are therefore not being hysterical, instead they have correctly identified what is happening, this is part of the journey to full membership. When this was pointed out to the excitable Europhile, he sought to shift his position to say that Ukraine will not become a candidate country by concluding the Association Agreement (emphasis mine). Even if that's what he meant, that wasn't his initial point, and I had never claimed the agreement made Ukraine a candidate country. That, after all, is a different step in the process. The Europhile had got it wrong and had to resort to constructing a strawman in an effort to save face. He was imprecise in what he said, or he had made a claim in ignorance of the facts. He has been discredited as a result. This is why all Brexiteers need to be careful, because the Europhiles are at play and if we are imprecise or make ignorant claims, they will pounce on us in an effort to discredit us in the same way. Stick to hard facts rather than mere opinion and be precise in what you say, and you will maintain your credibility for the time when undecided voters start to look at the arguments and claims just before the referendum. They won't support people who have been exposed as inaccurate and unreliable. Netherlands referendum: How very dare they! Oh dear. 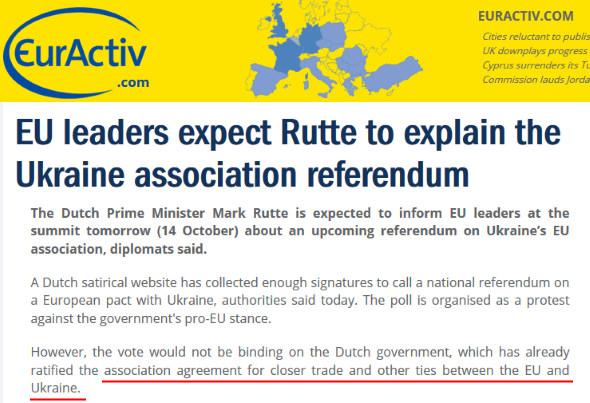 It seems the Dutch are in the EU dog house. The EU is annoyed that the Dutch political system makes it possible for mere ordinary voters to force a referendum, as long as more than 300,000 verifiable signatures are collected in support of one. 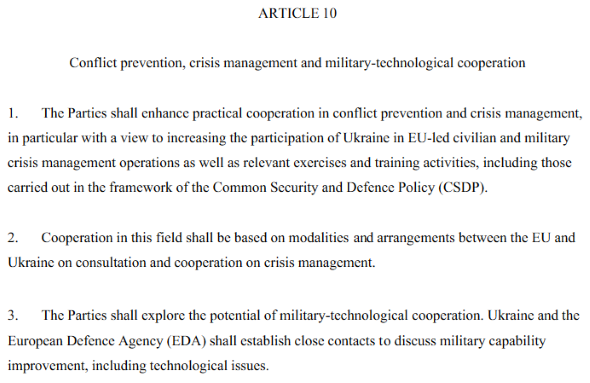 Note the EU's priorities and what the bloc considers to be the key parts of the deal. Trade doesn't feature. Instead, trade is a bolt-on that comes a long way down the list of objectives. It has played down the co-operation in foreign and security matters, although this was a major pillar of the agreement as the EU sought to show Russia who had political muscle, and failed. Title II of the association agreement included a section called Article 10 and you can read for yourself what that was all about. It was prioritised above anything to do with trade. Watching the Dutch debate could be instructive for people in Britain, helping them to understand the EU is not about trade, but about political control and hegemony. It could expose once again the unacceptable fundamental nature of the EU and remind us why we need to defeat David Cameron and his unilateral, arrogant decree that Britain should remain firmly anchored to the EU, by voting to leave. To think this direction of travel can be reformed, or that member states can opt out of it is plain fantasy. It's another reason to vote to leave the EU. Inconvenient as it may be for the Vote Leave campaign, wholly owned and run by Matthew Elliott and Dominic Cummings, there is enormous doubt about its suitability to be designated as the official leave campaign. This stems from the fact that Elliott has expressed views and aims that are fundamentally contrary to those of someone who wishes Britain to leave the EU. However, since 8.20am, in keeping with his selective vision and radio silence of yesterday, Cummings has still provided no answer. The hatch has been battened down and they are hoping it will all fade away. But it won't. The public has a right to know what the media's favourite to lead the official Leave campaign really thinks and the reasons why he wants to lead the Leave campaign despite every public utterance being in favour of remaining in a reformed EU. Some people will be frustrated by this piece. Many will argue that everyone on the Leave side should come together to work to the common goal of winning the referendum and leaving the EU. Some will describe this as sniping as harmful to the cause, while others will say this is a circular firing squad that will undermine efforts to achieve Brexit. But the fact is the rival campaigns have different agendas. This is not an effort to undermine a rival, but an effort to expose and defeat an opponent. Regardless of the quality or inaccuracy of some of Leave.EU's campaign work so far, Arron Banks and his team genuinely believe that Britain should leave the EU no matter what, as a point of principle, and they are investing money, time and hard work to help enable it to happen. For them leaving the EU is a cause. That's how it should be. They are allies in this fight. But when it comes to Matthew Elliott, it's impossible for any rational person to make a similar argument. He has spent years arguing, pressing and calling for Britain to remain in a reformed EU, opposing those of us who have been consistently made the case that Britain should leave. That isn't the behaviour or mindset of someone who believes in leaving the EU. Never has he said Britain should leave the EU on principle. Yet as he has always planned and his media contacts have long trailed, he's position himself to lead the official Leave campaign. Like an agile chameleon, he has transformed himself in an attempt to seize control of something he has stood against having always pushed his line of staying in the EU with reforms. Take a moment to let the enormity of what has happened to sink in. A man who has been pushing for Britain to stay in a reformed EU always had the intention of controlling the campaign of people whose views he rejected. Why? Elliott and his closest colleagues have conveniently set out the most likely reason themselves. They've formed companies between them, used Elliott's position in the No to AV campaign to get official positions which has then allowed them to award contracts to themselves (h/t Boiling Frog) which is a massive conflict of interest. But they have gone further, with an objective of building a database containing voter preferences, key issues and intentions from around 500,000 data records into one containing over 10 million records, but with a target of 20 million voter records, unprecedented in UK politics. The value of this data to political parties and campaigns is huge and the proceeds from selling it would be lucrative. The nationwide campaign ahead of a referendum will not only result in jobs and contracts for Elliott's friends, but essentially it will also enable the harvesting that data. 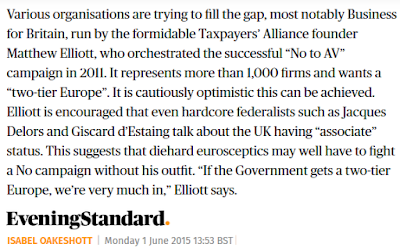 For Elliott and his inner circle leaving the EU is a massive business opportunity. That's is not how it should be. They are not allies in this fight. And every time they are questioned or challenged about this as shown at the top of this post, they go silent, refuse to reply, and hide away hoping it will all quietly go away. 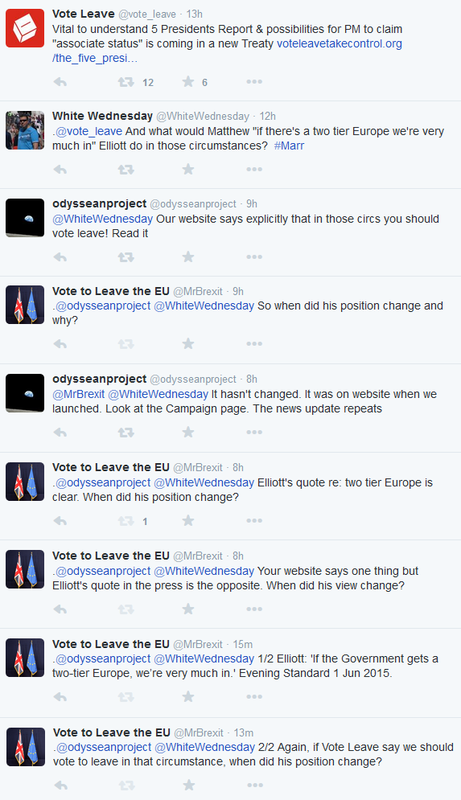 Taking all this into consideration, is Vote Leave an appropriate organisation to lead the official Leave campaign? People can draw their own conclusions. Andrew Duff is a Liberal Democrat arch federalist. He was MEP for East of England until defeated in the European elections last year. As a Visiting Fellow at the European Policy Centre and President of the Union of European Federalists, he is a true EU insider. His connections and access to people who really know what is going on in Brussels is beyond contest. With that in mind, when Duff writes a piece focusing on the David Cameron's 'renegotiation', the EU reaction to it and what can or cannot be achieved, he is worth reading. 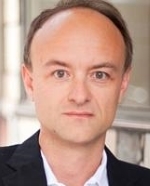 He has written one such piece for the German Verfassungsblog. It is worth reading in full, but below are some key sections along with some commentary of my own to put things in context. As things stand, it looks as though the prime minister will be fighting a fairly lonely referendum campaign with the backing of some but by no means all representatives of business and the City of London – and with his own government and party split asunder. This is because the campaign is an overtly Tory stitch up. 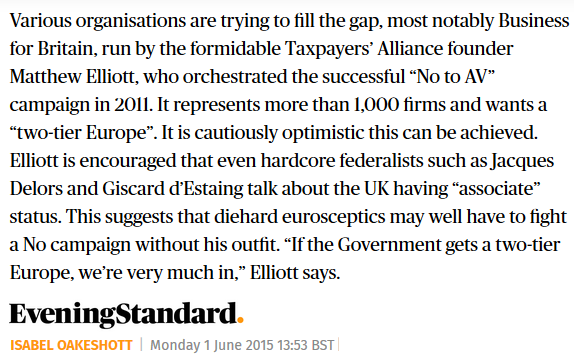 That's why hangers on like Matthew Elliott, are being backed by Tory grandees who are also supporting Cameron. It's an absolute con. Elliott and his friends, 'Elliott's Four', stand to make a lot of money from the campaign if they win official Leave campaign designation by awarding themselves positions and contracts as they did in the No to AV campaign, enabling them to hoover up huge volumes of data. The Tories stand to gain electoral and political intelligence about millions of voters from the purchase of that data from Elliott's Four and with Elliott at the helm the Leave campaign will almost certainly be as badly run as the No to AV campaign, and lose. Belated recognition of these apparently unforeseen difficulties has forced Cameron to delay presenting his EU partners with a substantial catalogue of explicit demands. Instead, he and his team are going about Europe talking of ‘baskets’ of issues such as transparency, vetoes for national parliaments and reserve powers for non-eurozone states to block the eurozone majority: no texts have yet been tabled. The result is that nobody quite knows what the British are doing. London’s vague and often conflicting messages are mystifying. At the EU institutions, indeed, other important matters are more pressing than Brexit. While the sham renegotiation and run up to the referendum gives the UK media the kind of bust up it loves to drool over, observations about the relative lack of importance of the Brexit saga in Europe is an inconvenient reality. The EU has bigger fish to fry. 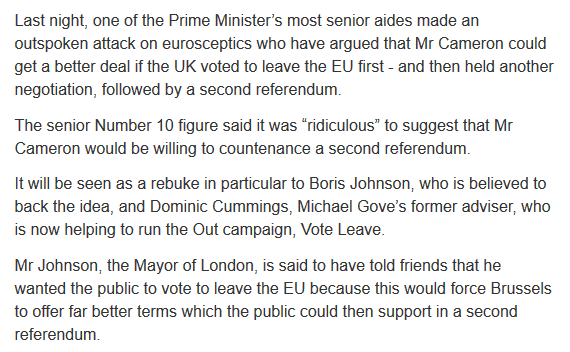 For the EU this isn't an important matter because they know Cameron isn't serious. It's all theatre. Amid this general British grumpiness there is the very specific demand to extricate the UK from the historic mission of the Union to ‘ever closer union among the peoples of Europe’. This issue is not merely of marginal significance, as is often alleged by pro-Europeans who should know better. The phrase has always appeared in the preambles of successive European treaties, but was upgraded in the Maastricht treaty (signed by Cameron’s predecessor as Tory prime minister, John Major) and given pride of place in Article 1 of the Treaty on European Union. 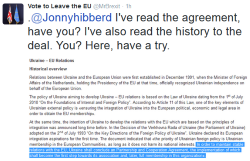 There is no precedent in the history of the EU of a member state ripping up its existing treaty obligations. It is true that both Denmark and Ireland were granted special Council decisions and (non-binding) declarations in the effort to overcome negative referendum votes on the Treaties of Maastricht, Nice or Lisbon. But these were concessions designed to permit treaties that had already been signed by every head of government to enter into force. The supplementary agreements were mainly of a tautological or oxymoronic nature – affirming that the treaties meant in fact what they said – although some took the form of promised future additions to treaty texts. (A similar agreement after the signing of the Lisbon treaty was made with the Czech Republic concerning the Charter of Fundamental Rights but was never delivered.) It is important to note, however, that none of those special measures amounted to new opt-outs; none made any substantive change to the treaties as agreed; and all were crafted, with a mixture of high politics and low cunning, to accomplish a successful ratification of a treaty change which deepened the integration of Europe. Such honesty cannot be found among Cameron and his team. It would not help their case for remaining in a dishonest and anti democratic union that revels in tricking people in order to further its own interests at their expense, and making promises it has no intention of keeping. What Duff goes on to talk about isn't new for those who have carefully monitored the EU Referendum blog, but is nonetheless dynamite because it is a Europhile admission of reality that reinforces what will not be possible, despite Tory assurances to the contrary. To be fair to David Cameron, he has been talking for ages about the need for treaty change. He must now accept that the next general revision of the treaties will not begin until after 2017 when the French and German elections and the British referendum are out of the way. So the temptation now looms to go for a limited bilateral treaty between the UK and the EU to ‘resolve the relationship’, as Hammond puts it. Yet this is another false trail. Such a new treaty would have to amend the UK’s treaty of accession to the European Community which was signed by the then Conservative prime minister Edward Heath on 22 January 1972. The preamble to that treaty says its signatories were ‘united in their desire to pursue the attainment of the objectives’ of the Treaties, and ‘determined in the spirit of those Treaties to construct an ever closer union among the peoples of Europe on the foundation already laid’. That statement, incidentally, rather gives the lie to those British eurosceptics like David Cameron who pretend that the decision to join the EEC was about a common market only. But it suddenly carries greater weight as one of Heath’s Tory successors seeks to remove it. The provisions of this Act may not, unless otherwise provided herein, be suspended, amended or repealed other than by means of the procedure laid down in the original Treaties enabling those Treaties to be revised. So short cuts are ruled out. Today, the relevant revision procedure is found in Article 48 TEU which lays down that an amendment to or derogation from Article 1 would require all the works: a constitutional Convention (if the European Parliament so insisted, as it would), followed by unanimous agreement between and ratification by all twenty-eight member states of the Union according to their own constitutional requirements (which in many cases means referenda). Try as they might, the cleverest EU lawyers will find no route to satiate the British desire for an irreversible, legal guarantee that would change the nature of the European project. The likelihood increases, therefore, that the Brexit renegotiation is doomed to fail and that the referendum results in a vote to leave the EU. Once that happens we are plunged into Article 50 territory and complicated secession negotiations lasting about two years. The end product will be a ‘withdrawal agreement’ in the form of a bilateral treaty between the UK and the EU. It will be negotiated by the Commission and concluded by the Council, acting by qualified majority without the British, after obtaining the consent of the European Parliament. If treated with care, that new treaty might possibly comprise a package deal to craft a new form of affiliate membership of the Union that might suit the UK as well as other determinedly anti-federalist, non-eurozone states. Once the full facts are known, a second referendum should not be ruled out. Once again, it is worth reading the whole original piece as there are other valuable insights that can help inform an effective Leave campaign. Duff's candour does little to help Cameron and the Remain campaign, rather it makes him one of the best allies the Brexiteers have in the fight to leave the EU. It cannot be overstated how vital it is to understand your opponents, and to that end Duff is great resource to have.